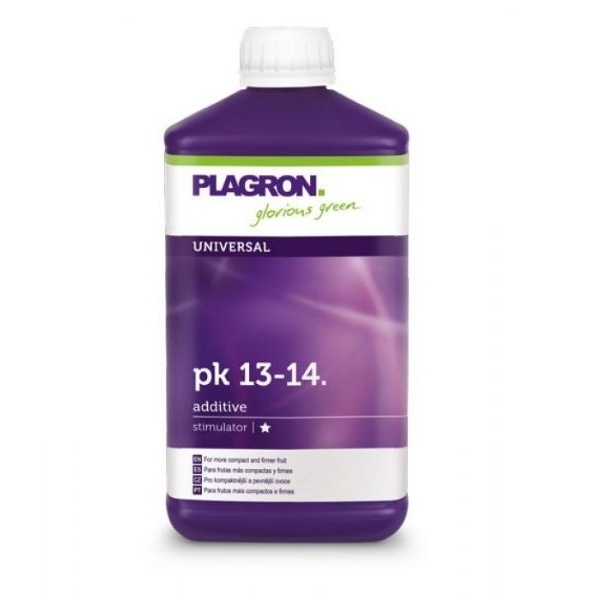 Plagron PK 13-14 is a bio-mineral fertilizer plants of additional phosphorus and potassium provides for the flowering stage. This creates denser, harder and heavier fruits. PK 13-14 guarantees a high yield. Application: For compact and firmer fruit. Composition: EC FERTILIZER. Solution of PK fertilizers (0-13-14). 13% Water-soluble phosphorus pentoxide (P 2 O 5), 14% water-soluble potassium oxide (K 2 O). Information for Users USA, regarding heavy metals, click here. For use: Shake well before use. Add 2 ml of PK 13-14 per 1 liter of water (1: 500). Then add basic nutrition to the desired EC value is reached. Use this nutrient solution every time you water the in the flowering stage. Click here all our Plagron Products.